(CNN) — A Danish zoo that made international headlines last month when it killed a healthy giraffe is once again in the news after it killed four lions to make way for a new male. 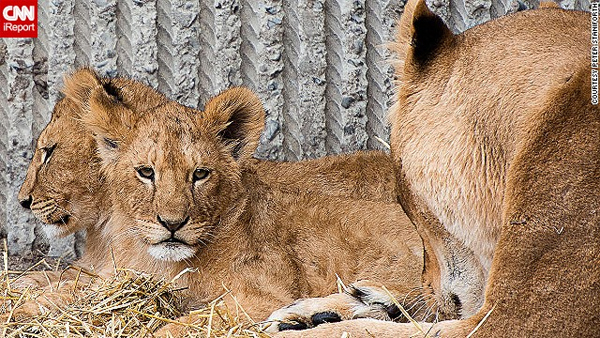 The lions were killed Monday, said Tobias Stenbaek Bro, a spokesman for the Copenhagen Zoo. The other two are the youngsters’ parents, described by the Copenhagen Zoo as a “very old” breeding pair. The new male lion was brought from Givskud Zoo, also in Denmark, to form a breeding group with the Copenhagen Zoo’s two 18-month-old females, born on site in 2012. The zoo had to put down the old lions and their young offspring “because of the natural structure and behavior” of the lion pride, the Copenhagen Zoo said in a prepared statement. The newcomer is about 3 years old, large for his age and healthy, the zoo said. After he’s had a few days to adjust to his new surroundings, visitors will be able to see him. “He is a beautiful young male and I am certain he will be an impressive ambassador for his species,” zoo chief Steffen Straede is quoted as saying. The decision by the Copenhagen Zoo to shoot dead its giraffe, named Marius, in February to prevent inbreeding sparked widespread outrage. The killing of four healthy lions has prompted further dismay. Some questioned why the lions weren’t sent elsewhere if the Copenhagen Zoo no longer had space. “Why are people visiting this abhorrent animal slaughter house,” said a message posted on a Facebook page that calls for the closure of the zoo. The zoo supports natural cycles of reproduction and cub rearing, it said, and its lions are not part of a breeding program. “While EAZA regrets the death of the animals in question, we recognize the right of Copenhagen Zoo to humanely cull them in line with their policies,” it added. Such culling is not uncommon, although large animals are less likely to meet that fate. European Association of Zoos and Aquaria spokesman David Williams-Mitchell told CNN that across the European zoos governed by the body, about 3,000 to 5,000 animals are killed each year under programs to manage zoo populations. Marius the giraffe was shot by a veterinarian and dismembered in front of an audience that included children, before being fed to the zoo’s lions, tigers and leopards. Addressing criticism after that killing, Bengt Holst, the zoo’s scientific director, told CNN the decision was made for the greater good of the giraffe population. But the explanation did little to appease public anger. The backlash prompted another zoo in Denmark to reverse course. Jyllands Park Zoo had said it was considering culling one of its male giraffes if a female was brought in to breed. But it backtracked.